Today's post is contributed by Edward Hartwell Goose of PA Consulting, who is working on an App for the UK’s Met Office to report everyone's favorite bit of small talk, the weather. We hope you find the discussion of his team's experience using App Engine illuminating. The UK’s Met Office is one of the world’s leading organisations in weather forecasting, providing reports throughout the day for the UK and the rest of the world. The weather information they provide is consumed by a variety of industries from shipping to aircraft, and powers some of the UK’s leading media organisations, such as the BBC. Although the Met Office is the biggest provider of weather data, they aren’t the only ones collecting information. Thousands of enthusiasts worldwide collect their own weather data, from a wide variety of weather stations - either simple temperature sensors or highly sophisticated stations that rival the Met Office’s own equipment. The question of course is: how do you harness the power of this crowd? The Met Office and our team from PA Consulting worked together to answer this question late last year. The end result was The Weather Observations Website, or “WOW” for short. 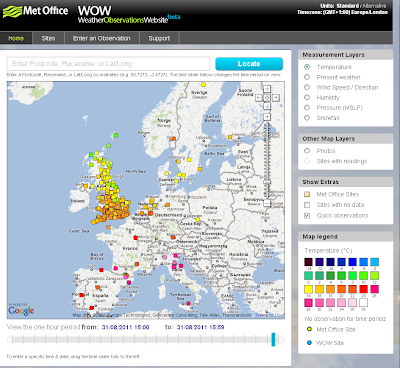 In the 3 months since launch on the 1st June 2011, WOW has recorded 5.5 million weather reports from countries throughout the world. Furthermore, we can retrieve current reports in sub second times, providing a real time map of worldwide weather. We haven’t got the whole globe covered just yet and the UK carries the most sites, but most countries in Western Europe are reporting. We also have reports from a medley of countries throughout the world, from Mauritius, Brazil and as far away as New Zealand. We even have one site reporting at regular intervals in Oman (it’s hot!). Better yet, as a development team of 2, since launch, we’ve spent almost no time at all doing anything but casual monitoring of WOW. No one carries a pager, and the one time we did have problems (we underestimated demand, and our quota ran out), I was able to upgrade the quota in a minute or so. And I did it from my sofa. On my phone. We learnt a lot building WOW. A huge amount in fact. And we’d love to share our insights with you. We’d also love to tell you what we love about App Engine - and why you should use it too. And so you know we’re honest - we’ll tell you what we don’t like too! Firstly - the good stuff. We think App Engine is a fantastic tool for prototyping and any team working in an agile environment. We’re big fans of SCRUM at PA Consulting, and App Engine was a dream to work with. Compared to some of our colleagues working with difficult build procedures and environments, our full release procedure never took more than 5 minutes. Better yet, App Engine’s deployment tools all hook up with ANT and CruiseControl (our continuous build system), allowing us to run unit tests and deploy new code on every check-in to our code repository. This allowed us as developers to get on with what we do best: develop! These three principles have given WOW the performance it has, and will allow it to scale effectively over the coming years. We’ve got some big changes coming over the next couple of months too that should provide even higher performance as well as exciting new features. So, how about improvements App Engine could make? There are definitely a few, although how important they are will depend on the problems you’re trying to solve. To begin with, improvements to some of the non technical elements are needed before App Engine becomes truly mainstream. Needing a credit card to pay is a showstopper for some organisations. Backup and restore is also missing, unless you implement it yourself. This is perfectly possible, but can add significant man days to your development effort if your data structure is complex and fast changing. We also struggled with how to estimate quota to begin with too. One of the brilliant features of App Engine is how easy it is to spool up (and down) new instances to deal with demand. Unfortunately, this also means it can be quite easy to accidentally spool up too many instances and burn quota quickly. Although this has never affected the actual data, it can cause an unpleasant spike in the amount of dollars spent. We also had a similar problem with a MapReduce job getting stuck overnight that caused a scare the next morning. Hopefully the new monitoring API should provide a bit more visibility of these issues as well as automatic email notifications to help catch these issues. Aside from that, other features will probably depend on the application you’re trying to build. Built in support for geo-queries would be invaluable for WOW. Currently we use an external library, but this adds some extra overhead on our development. Another common feature request is full text search which is essential for projects dealing with large text corpa. Both of these features would allow us to provide better search facilities for our users - for example search by site name or geographic location. These queries can be implemented in App Engine as it is now, but achieving optimal performance and optimal cost are difficult problems that we struggle to complete ourselves. Overall, we’re really impressed by App Engine. The App Engine team regularly releases new versions, and although it does have limitations it has allowed us to concentrate on what really matters to us - the weather. We know WOW will scale without any problems, and we don’t have to worry about any of the hardware configuration or system administration that can easily consume time. Our small team of developers spends all of their time understanding the business problems and improving WOW. 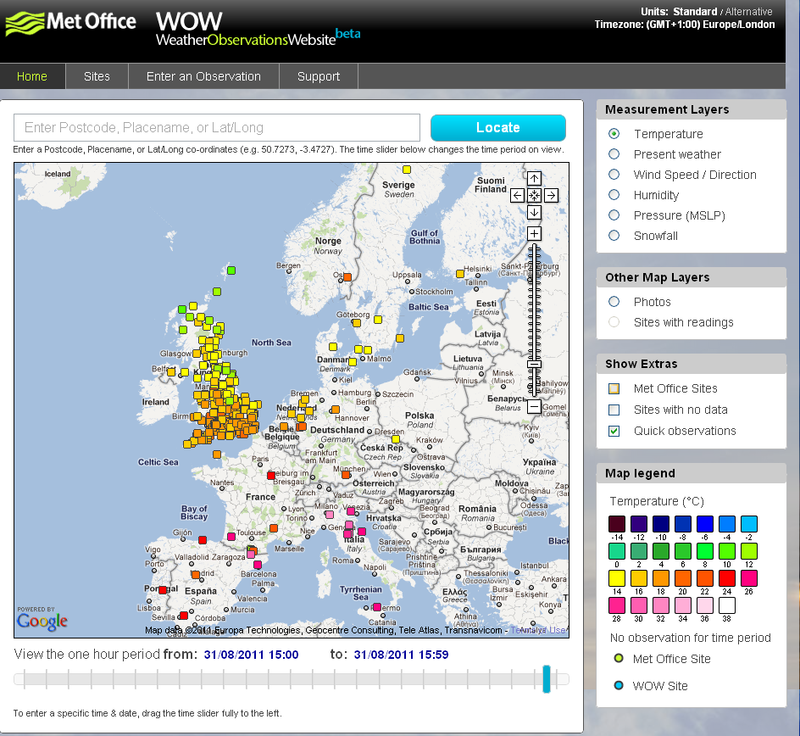 We’re really looking forward to taking WOW forward in the future, we hope you can join us: http://wow.metoffice.gov.uk. All searching at the moment is geographical, for which we use the standard Google Maps/Google Search API's. We don't currently implement any text searching on App Engine itself. How much does the new pricing affect you? I believe it won't, at least not significantly. We've been aware of the price changes since March (or whenever it was at Google I/O they were announced), so we've worked around them. I can't really give you any more details than that unfortunately. Our login server is not on App Engine (and not just due to the SSL limitation). Nice work Edward, I am really impressed with the performance of the site. Currently I am working on a location based application that I am considering google apps engine for its deployment, so can you give some recommendations regarding the java tools and frameworks to use (GWT, JSF, etc..).